I am almost certain that the first time I heard of Kombucha was from Eyes of Wonder’s blog. My friend Hannah-Banana makes it, which made the process seem much more doable. She has the experience and was a much needed inspiration. My bag of starter (SCOBY) came on Ethan’s birthday. So I set it aside on the counter (oh no, will I EVER get around to it??). 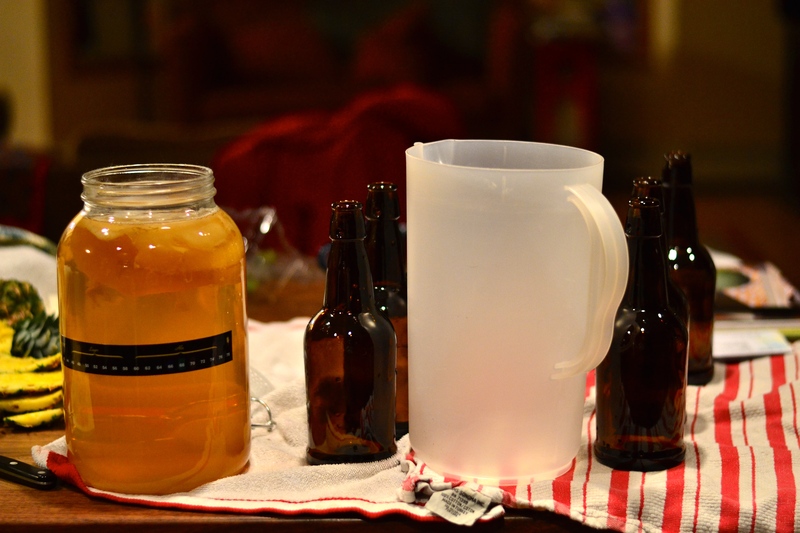 I felt that I simply must just take the plunge, so using the print out that came with the SCOBY, and my valuable book, I nervously sterilized my equipment and made my first batch on a Friday night. (the 6th of March, day AFTER the birthday). 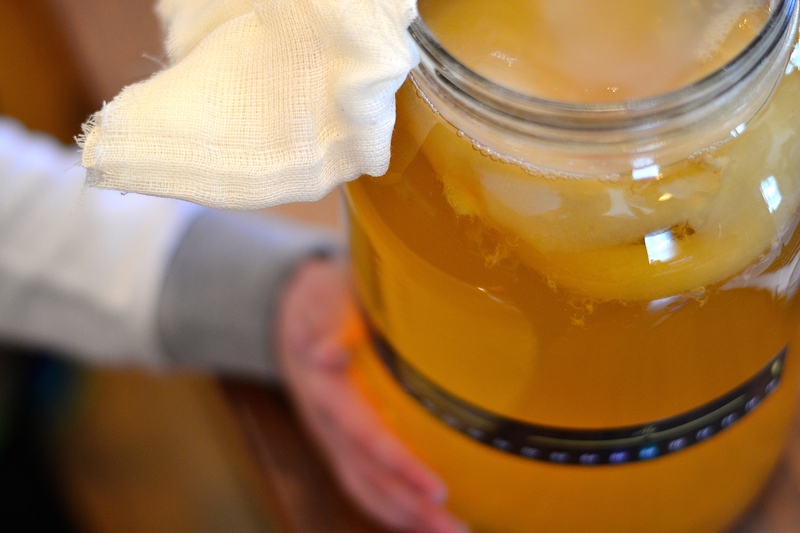 In a nutshell, what you do to make the drink is to brew a tea solution with one cup of sugar, then add the SCOBY, put cloth over the top and let it sit for a week or more to ferment. My gallon jar of tea and SCOBY was placed in my closet. It needed to be in a warm, dark, quiet place and after thinking it through I felt that my closet was the best room in the house for such things. Over a week went by and I started texting Hannah through Facebook (she should live next door, but she lives in Alaska) about when my Kombucha should be done, did I do it right? Should I have used soap to scrub my jar? Should I have used tap water for the tea? She could sense my anxiety and told me not to stress, all would be well. Indeed, the print-out did encourage saying a blessing over your beverage and sending it nothing but good vibes…..so I took a deep breath to release the stress, checked my jar, took a few pictures to send to Hannah, and she agreed that it really did look as though it was thriving. The SCOBY was growing. 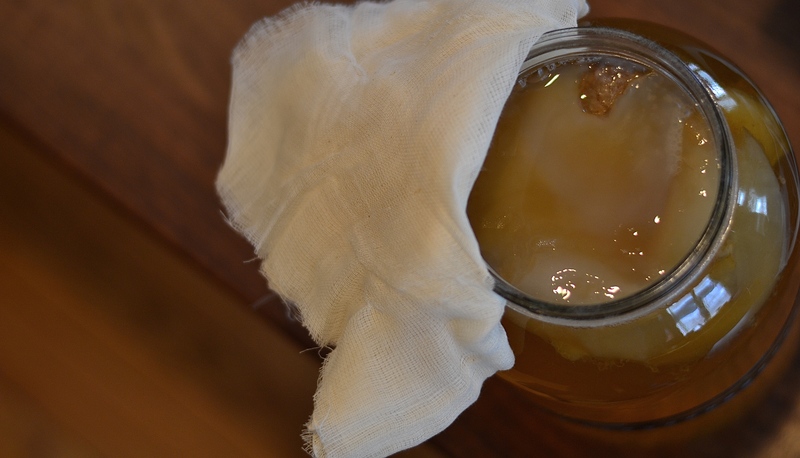 Seeing the new scoby forming filled me with pride. I put it back in the closet for three more days, when I decided to be brave and try a sip. 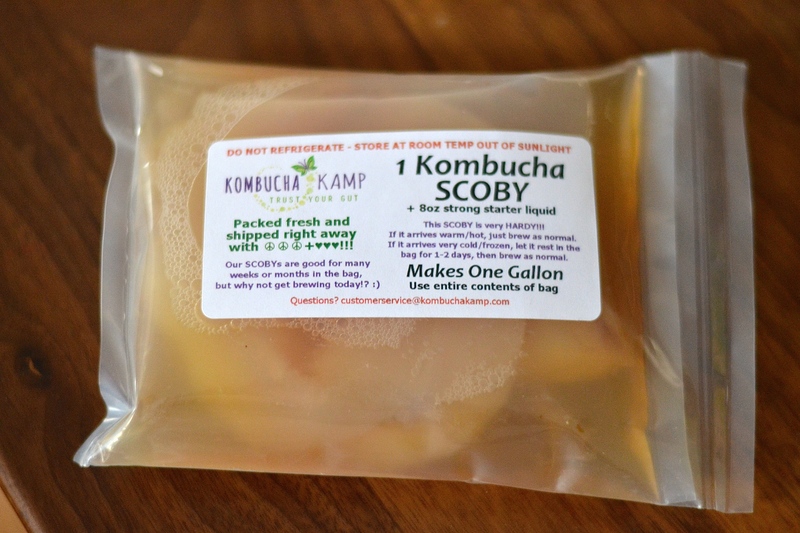 I’ve had Kombucha from Target before so I knew what to expect….and my taste-test tasted great! 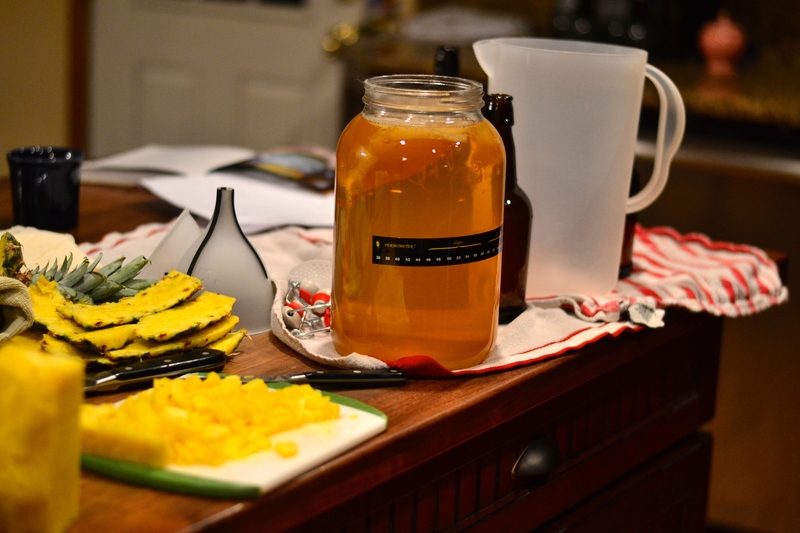 On Monday night, with Grace sitting at the counter making me laugh, I chopped up a fresh pineapple and bottled the drink for it’s second fermentation. I took the scoby off the top of the jar with my hands and put it in a glass pitcher with 2 cups of the tea (to use for the next batch), and then poured the rest into the plastic pitcher. Then I poured the tea out of the plastic pitcher through a funnel into the bottles, in which I had added a few tablespoons of pineapple. I ended up with six bottles to put back in the closet to ferment. I opened up the first one last night and it was delicious. Um, the kids don’t seem to like it though. Rich had to work very late last night so he has to try it later on today. He’s had the Target Kombucha and I sure hope he thinks our home-brew is just as good, if not better. I have another gallon of it brewing in my closet and it should be done by Monday. I told Grace that Monday night bottling will have to be our new tradition. It was fun to have her company in the kitchen. Next time I will try a different flavor, too. Every batch will be blessed. 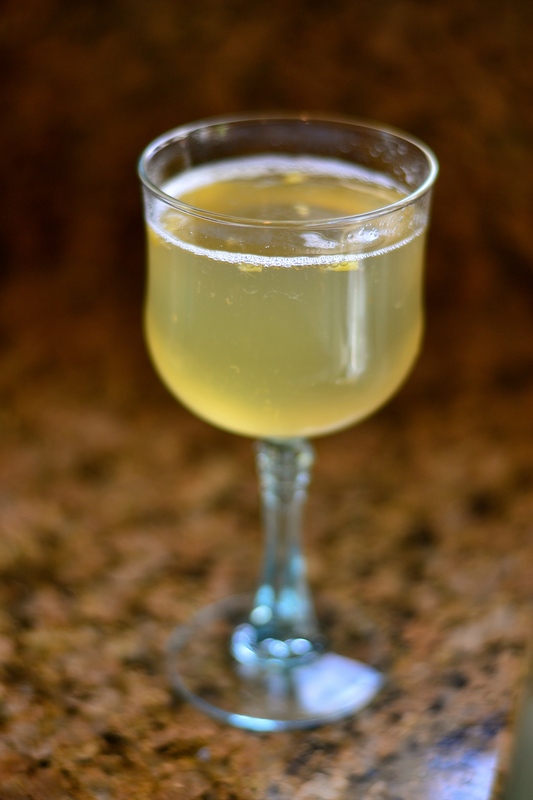 This entry was posted in a simply lovely life, food and tagged homemaker, kombucha, recipes by Shanda. Bookmark the permalink. HI Jenny, you are right, I think they will catch on as well. I hope to get another gallon going eventually, too. Do you have any techniques to share with me? Favorite flavors? Hi Debi, Rich did like it, he said it was much better than the store-bought version. He loved eating the pineapple out of the bottle, too. In the blog post, I added the link to the book I purchased which gives detailed directions. Also, the supplier that I used to buy the SCOBY also sent along instructions. It’s quite easy! So glad to hear that Rich liked it! I would like to try making it. Just maybe Lewis would like it, too … he does like pineapple. 🙂 I’ll check out that link you shared and take a look at the book. Thanks so much, Shanda!